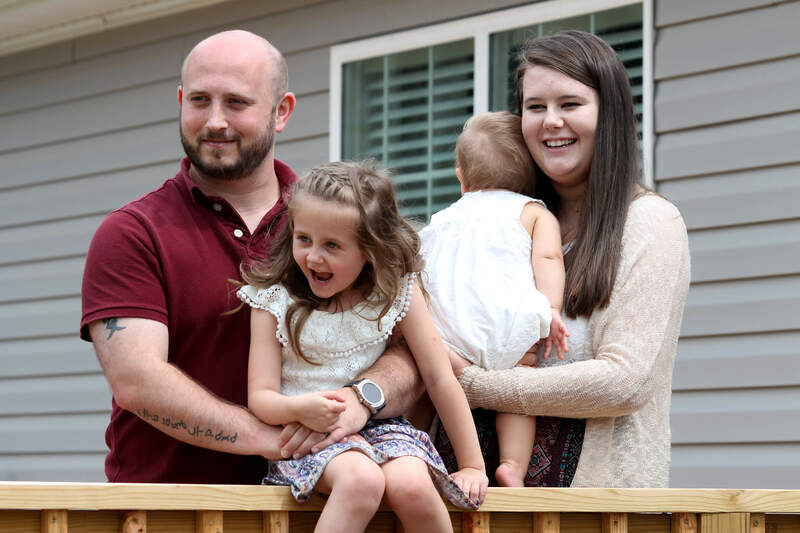 Robert and Chasity Woody are first-time homebuyers in their early 30s. The Woodys have two beautiful daughters – four-year-old Calie and one-year-old Aria – who love to play and didn’t hesitate at all to invite us to play with them for a while. Robert is a Navy combat veteran who served in Operation: Iraqi Freedom, working on aircraft carriers. He now works in the corrections department in Buncombe County, North Carolina. Chasity is a stay-at-home mom. You can tell that she enjoys photography from the gorgeous prints of her children on the walls, and the telescope in the corner illustrates her interest in astronomy. After meeting with Self-Help Homeownership Manager Joe Quinlan and his team, the Woodys decided that a new modular home in Mars Hill, about 20 minutes north of Asheville, would best suit their needs. The community, overlooking Mars Hill University, has breathtaking scenery and a long walking loop. Robert and Chasity enjoyed the process of buying their Next Step home. They loved being able to customize their home by choosing colors, textures and patterns. The family often visited the site to watch the installation process, and they moved in the day after the driveway was complete. Robert and Chastity were so excited to move into their new home, they walked their belongings into the home from the road before the drive was set. Since moving in, their utility bills are than $80 a month, and the mortgage payment is significantly less than their previous rent. Robert and Chasity are saving money, putting aside savings for family trips and their daughters’ education.